André-Denis Wright, Dean of CAHNRS, joins Randy Honcoop, research chair with the Washington Red Raspberry Commission, Adam Enfield, raspberry farmer and commission member, and Chad Kruger, director of the WSU Northwestern Washington Research & Extension Center at Mount Vernon, in a check presentation in support of berry research at WSU, during the Washington Small Fruit Conference, Nov. 28, 2018. CAHNRS Dean André-Denis Wright joined Washington State University scientists sharing the latest research supporting the Northwest’s berry industry, at the Washington Small Fruit Conference and Lynden Ag Show, Nov. 28 at Lynden, Wash. Presented in collaboration with the Washington Red Raspberry Commission, Washington Blueberry Commission, and Whatcom County Extension, the event highlighted the latest discoveries and innovations in berry production. Along with the Dean, more than a dozen researchers from across WSU Extension and the College of Agricultural, Human, and Natural Resource Sciences, including Chris Benedict, Lisa DeVetter, Weixin Gan, Suzette Galinato, Beverly Gerdeman, Wendy Hoashi-Erhardt, Gwen Hoheisel, Olga Koshar, Tim Lawrence, Tim Miller, Betsy Schacht, Huan Zhang and Meijun Zhu, discussed advances in mites and disease control, blueberry cold-hardiness, mechanized harvest, plastic mulches, berry pollination, weed management, biofertilizers, food safety, and much more. 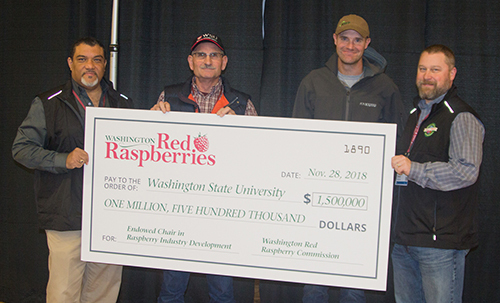 CAHNRS participants also thanked the Washington Red Raspberry Commission for their recent $1.5 million investment in a new Endowed Chair in Raspberry Industry Development at WSU. With nearly 95 percent of the nation’s red raspberry crop produced in Washington state, WSU’s new Endowed Chair in Raspberry Industry Development will advance cutting-edge technology and research assisting growers. Learn more about this year’s Small Fruit Conference here. Learn more about WSU Extension here.